A very useful book on packing horses, mules and burros. Equipment, how-to, supplies, hitches and knots, survival and more. Used as a teaching manual at the University it is packed with information and illustrations. 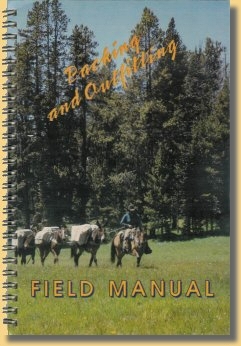 The purpose of this packing and outfitting manual is to provide basic information in an organized manner to help you learn about horses and equipment and to effectively plan and take pack trips in the great outdoors. Use of qualified persons to help with the teaching of packing fundamentals, and references such as this manual, will make packing easier and more fun. To demonstrate how to tie packing hitches properly - half diamond, single diamond, double diamond, squaw hitch, basket sling, barrel sling, and Arizona hitch. Also how to tie on a sheepherder stove, pack meat, and tie off a hitch. To illustrate and assist you in learning how to tie properly the 20 knots shown in this manual. To show food and equipment lists applicable to groups of different sizes. To outline principles of setting up trip itineraries. To emphasize human and horse first aid kits for on-the-trail care. To show the need to know the basics of wilderness survival. To create an awareness about Game and Fish and Forest Service regulations, and licenses governing packing and outfitting as a business. To show a variety of photos and drawings to assist in understanding packing and outfitting.